^ 1.0 1.1 US Gazetteer files 2010. United States Census Bureau. [2012-12-19]. ^ State and City Quickfacts. U.S. Census Bureau. [2006年11月13日]. （原始内容存档于2006年9月22日）. ^ U.S. Census Bureau Delivers Washington's 2010 Census Population Totals, Including First Look at Race and Hispanic Origin Data for Legislative Redistricting (.xls). U.S. Census Bureau. 2011-02-23 [2011-03-26]. ^ American Hop Museum. [2009-03-05]. （原始内容存档于2013-01-12）. ^ State and City Quickfacts. U.S. Census Bureau. [2006-11-13]. （原始内容存档于2006-09-22）. 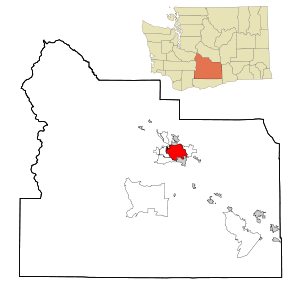 ^ City of Yakima History. City of Yakima. [2006-12-28]. ^ 12.0 12.1 NowData - NOAA Online Weather Data. National Oceanic and Atmospheric Administration. [2013-07-01]. ^ Average Weather for Yakima, WA - Temperature and Precipitation. The Weather Channel. [2010-05-15].